Jason Robinson's Janus Ensemble: "Tiresian Simmetry" and "Resonant Geographies"
Jason Robinson's Janus Quintet: "The Two Faces of Janus"
Jason Robinson is born in California on 20 September 1975. American saxophonist and composer Jason Robinson grew up in the shadows of the magnificent Sierra Nevada mountains in Northern California. His early years were spent riding his bicycle past the property of the famed Folsom Prison, immortalized by Johnny Cash in "Folsom Prison Blues." Robinson was around music from the get-go; his father, a rock guitarist and songwriter, often invited him into his studio to help ride the faders in the days before automated mixing. Robinson's initial musical inspiration came from a combination of influences: Louis Jordan's infectious mixture of jump blues and bebop, Jimmy Hendrix's outrageous experimentalism, Charlie Parker's virtuosic redefining of the alto saxophone and jazz language, and the Beatle's late-period psychedelia. While in high school, he was influenced by the wonderfully eclectic Sacramento jazz scene, which at the time included a Tuesday residency by the legendary late saxophonist John Tchicai. Now a critically acclaimed and distinctive voice in a new generation of creative musicians, Robinson's interests thrive in the fertile overlaps between improvisation and composition, acoustic music and electronics, tradition and experimentalism. Continuing his ongoing partnership with Cuneiform Records, in Fall 2012 he released his seventh album as a leader, Tiresian Symmetry, featuring an expanded nine-piece version of his all-star Janus Ensemble. Inspired by Greek mythology and the music of Henry Threadgill, the recording uses unorthodox instrumentation: two tubas, two drumsets, and the provocative sounds of bass clarinet and its lower neighbor, the contra bass clarinet. Robinson's Janus Ensemble features stellar figures in the New York creative music scene: Drew Gress, Marty Ehrlich, Ches Smith, Marcus Rojas, Liberty Ellman, JD Parran, Bill Lowe, and George Schuller. In 2010, Robinson released three concurrent albums showcasing an enormous breadth of creative work, including The Two Faces of Janus (Cuneiform), debuting his Janus Ensemble (with Marty Ehrlich, Liberty Ellman, George Schuller, and Drew Gress) along with special guest Rudresh Mahanthappa; Cerulean Landscape (Clean Feed), featuring the long time collaboration of Robinson and acclaimed pianist and composer Anthony Davis; and Cerberus Reigning (Accretions), the much anticipated second installment of the "Cerberus" trilogy, featuring Robinson's solo electroacoustic music. Robinson's professional career began in the San Francisco Bay Area, where he lived in the mid-1990s and was mentored by the late bassist Mel Graves. He was the first horn player in the hugely popular internationally touring roots reggae group Groundation (known for combining jazz, improvisation, and roots reggae), collaborated with a wide variety of Bay Area jazz musicians, founded Circumvention Music, and released his first album, From the Sun (1998/Circumvention). The Bay Area provided diverse musical opportunities that blurred stylistic boundaries and intersected with other social and political contexts. Robinson toured with the San Francisco-based New Pickle Circus, a European style circus, founded in 1974 and decidedly against the use of animals. He also performed with the legendary San Francisco Mime Troupe, a commedia dell'arte political theater group focused on challenging social and political issues in American culture. In the late-1990s, Robinson moved to San Diego, where he studied with trombonist and scholar George E. Lewis and pianist and composer Anthony Davis, and co-founded Cosmologic with trombonist Michael Dessen, bassist Scott Walton, and percussionist Nathan Hubbard. Active from 1999-2011, Cosmologic toured throughout the United States and in Mexico, Canada, Belgium, and the Netherlands and released four acclaimed albums: Staring at the Sun (2000/Circumvention), Syntaxis (2002/Circumvention), III (2005/Circumvention), and Eyes in the Back of My Head (2008/Cuneiform). During this period, Robinson also co-founded the Cross Border Trio, a collaborative transnational group that performed extensively throughout Mexico and within the US/Mexico border (frontera) region. Bi-national in membership and active from 2003 to 2008, the group's debut album New Directions (2006/Circumvention) achieved widespread critical acclaim. While in San Diego, Robinson was also a founding member of Trummerflora, a musician collective dedicated to supporting creative music in and beyond Southern California. Largely modeled after the influential African American musician collectives of the 1960s and 70s (the AACM, Black Artists Guild, etc. ), Trummerflora continues to produce occasional concerts in the San Diego area. Somewhat parallel to these experiences in creative jazz, Robinson has also worked extensively in reggae. This began with his involvement with Groundation (with whom he continues to record and occasionally tour) and evolved when he joined Elijah Emanuel and the Revelations in San Diego, a popular bilingual (Spanish-English) group fronted by Panamanian-born Emanuel. These experiences provided important opportunities to meet various legends of Jamaican popular music, several of whom he subsequently performed or recorded with, including Eek-a-Mouse, Leroy "Horsemouth" Wallace, Don Carlos, The Congos, Ras Michael, Marcia Higgs, Pablo Moses, and the Scientist. He was featured on Toots and the Maytals' Grammy-nominated 2007 album Light Your Light (Fantasy). He can be heard on a cut that features Toots in duo with Bonnie Raitt. Over the years, Robinson has appeared on nearly fifty recordings, including seven as a leader and seven as co-leader. At the present, he performs as a soloist (acoustically and with electronics), with his group the Janus Ensemble, and in a variety of collaborative contexts. He has performed at festivals and prominent venues in the United States, Canada, Mexico, and throughout Europe and/or recorded with Peter Kowald, George Lewis, Pauline Oliveros, Anthony Davis, Drew Gress, Rudresh Mahanthappa, Marty Ehrlich, Warren Smith, Eugene Chadbourne, Earl Howard, Matt Wilson, Bertram Turetzky, Howard Johnson, Mark Dresser, Curtis Fowkles, John Russell, Ches Smith, Roger Turner, Marcus Rojas, Gerry Hemingway, Bill Lowe, Kei Akagi, Mel Graves, Liberty Ellman, Babatunde Lea, Mel Martin, Marco Eneidi, Lisle Ellis, Raphe Malik, Mike Wofford, JD Parran, Ray Anderson, the Makanda Project, the San Francisco Mime Troupe, Toots and the Maytals, and Groundation, among others. Also a scholar, Robinson's written work explores the relationship between improvised and popular musics, experimentalism, and cultural identity. He has published articles and reviews in Ethnomusicology, Jazz Perspectives, and Critical Studies in Improvisation/ Études critiques en improvisation. Robinson is an Assistant Professor of Music at Amherst College and holds a Ph.D. in Music from the University of California, San Diego. A West Coast transplant now living in New England, he is married to Stephanie Robinson, an acclaimed performer, composer, and electronic musician. 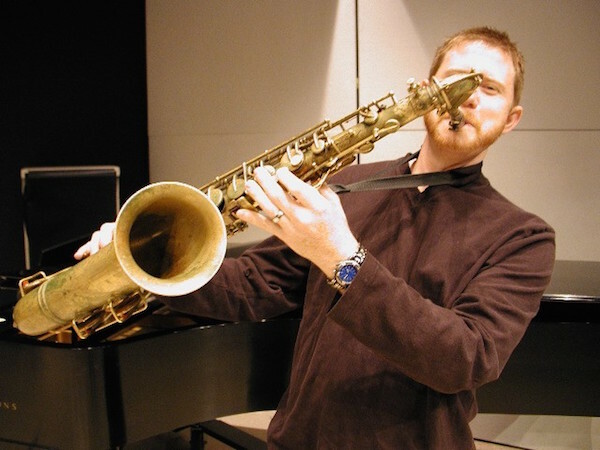 American saxophonist Jason Robinson is an acclaimed and distinctive voice in a new generation of creative musicians equally interested in improvisation and composition, acoustic music and electronics, tradition and experimentalism. Described by Ron Wynn of JazzTimes as "[o]ne of the most respected soloists and bandleaders in jazz's experimental wing," Robinson's music displays a deep sense of history in the midst of creative, free-wheeling exploration. Continuing his ongoing partnership with Cuneiform Records, in Fall 2012 he released his seventh album as a leader, Tiresian Symmetry, featuring an expanded nine-piece version of his all-star Janus Ensemble. Inspired by Greek mythology and the music of Henry Threadgill, the recording uses unorthodox instrumentation: two tubas, two drumsets, and the provocative sounds of bass clarinet and its lower neighbor, the contra bass clarinet. Robinson's Janus Ensemble features stellar figures in the New York creative music scene: Drew Gress, Marty Ehrlich, Ches Smith, Marcus Rojas, Liberty Ellman, JD Parran, Bill Lowe, and George Schuller. Over the years, Robinson has appeared on nearly fifty recordings, including seven as a leader and seven as co-leader. At the present, he performs as a soloist (acoustically and with electronics), with his group the Janus Ensemble, and in a variety of collaborative contexts. He has performed at festivals and prominent venues in the United States, Canada, Mexico, and throughout Europe and/or recorded with Peter Kowald, George Lewis, Pauline Oliveros, the Makanda Project, the San Francisco Mime Troupe, Toots and the Maytals, and Groundation, among others. Also a scholar, Robinson's written work explores the relationship between improvised and popular musics, experimentalism, and cultural identity. He has published articles and reviews in Ethnomusicology, Jazz Perspectives, and Critical Studies in Improvisation/ Études critiques en improvisation. Robinson is an Assistant Professor of Music at Amherst College and holds a Ph.D. in Music from the University of California, San Diego. A West Coast transplant now living in New England, he is married to Stephanie Robinson, an acclaimed performer, composer, and electronic musician. "Silence Becomes a Roar, from Fingerprint, is a complex, multi-section tour de force that draws melodic and harmonic inspiration from Duke Ellington and Gil Evans... the saxophonist himself has a warm expressive tone, occasionally dipping into freer realms yet always staying true to the structure of his compositions." "Robinson shines... Provocative and rewarding, Tandem makes it clear that Robinson's artistic evolution should be most fruitful." "Robinson brings some humor into the traditionally dour world of experimental music"
"sessions of scouring and mercilessly carcinogenic improvisation; speak softly, and carry a big sax"
"Robinson's special gift is an emotional intensity that keeps things at the boiling point." "Robinson plays his tenor with singes of fire." "Long gone are the days when things West Coast were considered pallid in relation to anything East Coast, and for any of the doubters out there, here's the proof positive." "One of the most respected soloists and bandleaders in jazz's experimental wing." "Robinson's compositions manage to draw a straight line through bop, Duke Ellington, Ornette Coleman and Eric Dolphy straight into the modern day with acute-angle swing, blues bluster and memorable themes that seem to scratch at the back of the mind with familiarity without resorting to quotation or imitation."